PEPTIDE DELIVERY - The Endometriosis Enigma – Why Can't There Be a Pill for That? PEPTIDE DELIVERY – The Endometriosis Enigma – Why Can’t There Be a Pill for That? Affecting approximately 6 million women in the US, endometriosis is one of the most common gynecological disorders and occurs when the endometrial lining tissue begins to grow outside the uterus, leading to lesions. These lesions may grow on the ovaries, fallopian tubes, and other areas of the uterus, causing severe pain. Leuprolide, marketed under the brand name LUPRON DEPOT® (leuprolide acetate for depot suspension), has demonstrated in the clinic and practice to be an efficacious treatment for endometriosis. However, the current parenteral route of administration limits the drug’s utilization due to the irreversibility of the depot injection, which stays in the body for 30 to 90 days, and the pain and inconvenience of the injections. 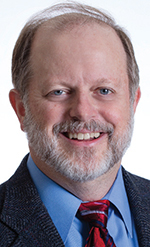 A daily oral leuprolide tablet could offer a more patient-friendly alternative to monthly depot injections, potentially encouraging physicians and patients to utilize the medication earlier and more often. Market estimates suggest such a drug could produce revenues in excess of $600 million annually in the US. So why isn’t there a pill for that? The challenge of capturing the potential of orally delivered peptide therapeutics is ongoing as researchers look to develop formulations that can overcome both business and technical challenges. The business challenge is pretty straight forward; select peptides and clinical indications that are appropriate for oral delivery. Practical considerations, such as whether the orally delivered peptide will enhance patient compliance, increase treatment options, and boost marketability, should have priority because without clear medical and business advantages, there is little motivation to make the investment in time and resources to transition from an injectable. Market and patient research indicates that an oral formulation of leuprolide for endometriosis would meet these criteria. The technical and clinical challenges are significant. There are numerous technologies currently in development that are designed to enable the oral delivery of peptides. 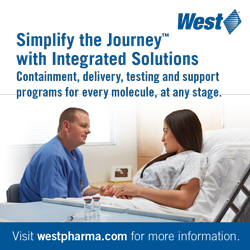 Though each has its unique set of properties and capabilities, all must overcome key obstacles to successfully deliver peptides via the oral route. First, the oral formulation must remain intact in the highly acidic environment of the stomach. Once through the stomach, the tablet design must then promote dissolution in the higher pH environment of the small intestine, while simultaneously protecting the peptide payload from degradation by protease enzymes. Finally, mechanisms must be present that facilitate the absorption of the peptide into the relatively impermeable intestinal epithelium. However, even with all the boxes checked, oral delivery may not be an option unless one can achieve therapeutically relevant bioavailability. Peptides and proteins are high molecular weight biopolymers and contain both hydrophilic and hydrophobic appendages in their structure. These properties make it difficult for peptides to be absorbed by the intestine. In addition, the stomach and intestine are designed to digest peptides and proteins into usable components. Simply said, our bodies recognize peptides as food when ingested. Protecting the therapeutic peptide long enough to deliver it to the right place in the system and in the right conditions to maximize absorption are the keys to successful delivery of an oral peptide. The question then is this: Is there a way to overcome the drug development challenges in engineering an oral formulation of leuprolide in a manner that allows one to effectively and efficiently capitalize on the market/patient potential of such a drug product? We know that proteins and peptides are the building blocks of life and recently have been identified as a very promising basis for targeting a range of diseases. Throughout the past 3 decades, and especially the past 10 years, there has been a rapid growth in the development of therapeutic proteins, with a significant increase in the number of protein-based drugs on the market. Peptides occupy a therapeutic niche between small molecules and large biologics, and are generally classified as being a chain of amino acids containing 40 amino acids or less. Currently, the disease areas driving the therapeutic use of peptide drugs are oncology (driven by a rising mortality and need for chemotherapy replacement) and metabolic diseases. The treatment of metabolic diseases via peptide therapeutics has largely centered around the epidemic growth in type 2 diabetes. Examples of such injectable peptide drugs on the market today include Byetta, Victoza, and Trulicity, which are part of the family of glucagon-like peptide-1 (GLP-1) receptor activators. These peptide drugs work by interacting with a receptor on the surface of pancreatic beta cells to stimulate the release of insulin. 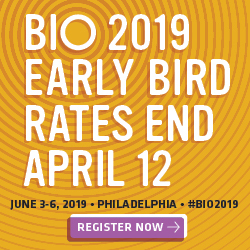 In addition to metabolic disease and oncology, the movement of the pharmaceutical industry into rare diseases and orphan drugs has also been extended to peptides, and peptides are being further targeted at infectious diseases and inflammation. Historically, all of these peptide drugs have been administered by injection. Research has demonstrated that peptide therapeutics can offer several advantages that are distinct and desirable. Peptides serve a highly specific set of functions in the body that cannot be mimicked by simple chemical compounds. 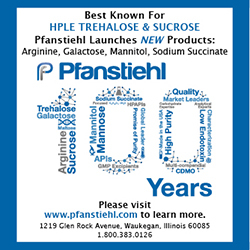 Thus, compared with small-molecule active pharmaceutical ingredients (APIs), peptides are able to exhibit increased potency and selectivity due to specific interactions with their targets. As a result, peptides have the potential for decreased off-target side effects and decreased systemic toxicity. Moreover, because the body naturally produces peptides, peptide-based therapeutics are often well-tolerated and are less likely to elicit immune responses. Given their attractive pharmacological profile and intrinsic properties, peptides represent an excellent starting point for the design of novel therapeutics, and their specificity has been seen to translate into excellent safety, tolerability, and efficacy profiles in humans. Furthermore, peptide therapeutics are typically associated with lower production complexity compared with protein-based biopharmaceuticals. Though peptide therapeutics offer numerous advantages, and the growth of such drugs is strong, there remains a significant gap between “market actual” and “market potential.” This is largely attributable to challenges with the route and method of delivery of peptide drugs. The interest in oral peptides is driven by three dynamics – patient compliance, prescriber preference, and market expansion. As one can appreciate, frequent injections and low patient acceptability make parenteral administration of peptide-based drugs less desirable. This is especially true in long-term treatment regimens. As a result, pharmaceutical developers continue to explore alternate routes of delivery for peptide therapeutics that have the potential to maintain the drug’s potency, while enhancing the ease of administration, patient compliance, and market penetration. Against this backdrop, the oral delivery of peptides, such as leuprolide, has caught the imagination of drug developers far and wide. Long hailed as the “Holy Grail” of drug delivery, orally administered peptides offer vast potential but also present considerable development challenges. In developing its oral leuprolide tablet, biotechnology company Enteris BioPharma utilized a technology platform designed to provide protection against the harshness of the digestive system and then promote absorption of the leuprolide into the bloodstream. First, to overcome the stomach’s highly acidic environment, the oral tablet was encapsulated in an enteric coating. 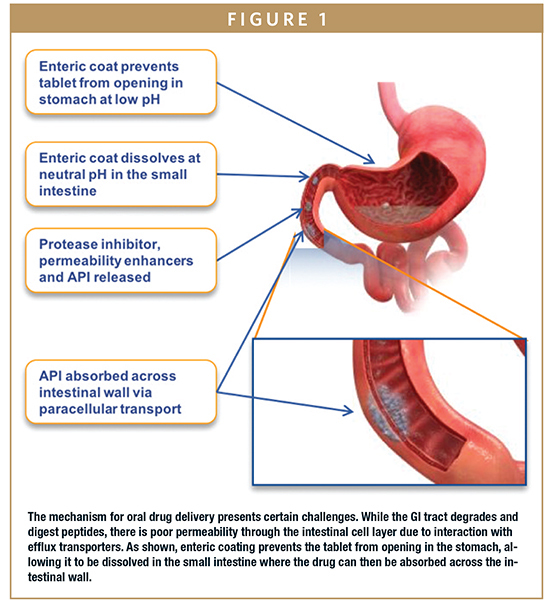 Simple in concept, an enteric coating is a polymer barrier applied to an oral medication that prevents its dissolution in the gastric environment. Enteric coatings work by presenting a surface that is stable at the highly acidic pH found in the stomach, yet dissolves at the higher pH of the small intestine and at locations within the intestinal tract to enable optimal drug absorption. A variety of materials can be utilized as an enteric coating, provided the material shields the peptide drug in the stomach and enables its release in the intestine where absorption into the bloodstream can occur. Protecting against the acidic gastric environment and enabling dissolution in the small intestine is but the first hurdle that must be addressed. The next goal is limiting proteolytic degradation in the jejunum, which is a considerably more difficult (and critical) proposition. Given that many peptides are highly vulnerable in the soluble form to peptidases in the lumen prior to reaching the systemic circulation, the challenge is to prevent the breakdown of the peptide. Though it is difficult to completely inhibit the actions of luminal proteases, scientists at Enteris BioPharma utilized protease inhibitors to create a protective microenvironment for its oral leuprolide tablet. Without such protective measures, the protease enzymes would immediately act upon the leuprolide, breaking it down for ingestion into the bloodstream; no different than a protein consumed as food. Shielding against the digestive system is paramount to administering a peptide orally, and success in developing an efficacious oral peptide (one that elicits the desired therapeutic response comparable to or exceeding the standard of care) ultimately hinges on whether the peptide is absorbed through the intestine and enters the bloodstream as an intact chemical species. As referenced previously, peptides have relatively large molecular weights and hydrophilicity, resulting in poor penetration across the intestinal epithelium. This may be the most challenging barrier to oral peptide delivery. As peptides reach the intestinal epithelium, they first encounter an exogenous mucus gel layer containing proteases and antibodies, which together reduce the rate of diffusion to the epithelial surface. Attempts to overcome mucoadhesion have focused on incorporation of mucolytics or use of hydrophilic PEGylated nanoparticles, which avoid entrapment in mucus glycoprotein meshes. An alternative approach is to exploit mucoadhesion to increase the residence time of the dosage form in the small intestine. However, greater success has been achieved via the use of permeability enhancers, such as lauroyl-l- carnitine chloride (LLC), palmitoyl carnitine chloride (PCC), and sodium taurodeoxycholate, which facilitate peptide entry into the bloodstream. Such permeability enhancers function by enabling the transport of peptide molecules through the epithelium via passive movement across the epithelial tight junctions. Finally, after overcoming these obstacles, the successful developer of an oral peptide must accept that the bioavailability of an orally delivered peptide will be less than that of a comparable dose of a parenterally delivered peptide. Even the best oral peptide formulas are known to have relatively low bioavailabilities of ≤10%. As such, higher oral formulation doses are required to obtain the same therapeutic effect achieved with an injectable formulation. For example, Enteris BioPharma recently announced interim results of a Phase 2a trial of its oral leuprolide tablet (Ovarest®) being developed to treat endometriosis (initial indication) comparing once- and twice-per-day doses of a 4-mg oral tablet with a single, monthly depot injection of LUPRON DEPOT 3.75 mg. 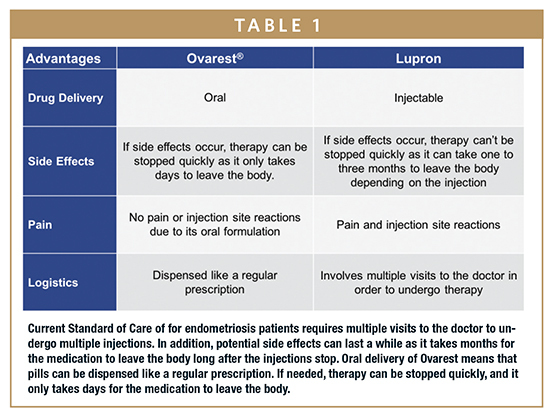 The daily dose of the Enteris oral tablet is therefore higher than the monthly LUPRON DEPOT injection dose. Data from the study, utilizing Enteris’ proprietary Peptelligence® platform, indicated that significant suppression of estradiol (E2), demonstrated a measurable pharmacodynamic effect that is tightly correlated with efficacy in endometriosis. A higher dose 10-mg tablet arm, administered twice-per-day of the Phase 2a study is currently underway, and Enteris expects to be in a position to announce the results from that arm in early July 2018. The Peptelligence® platform is a novel formulation technology that enables oral delivery of molecules that are typically injected, including peptides and BCS class II, III and IV small molecules. The positive interim results from the Phase 2a clinical trial are a significant advancement towards Enteris’ goal of developing the first-ever oral leuprolide tablet for the treatment of endometriosis (initial indication). Though orally delivered peptides, such as Ovarest, have considerable value potential, developers must carefully consider the practicality of transitioning a peptide to an oral form based on the cost of goods. Simply put, the cost of the additional API (and production) must be less than the expected market expansion for an oral formulation. Considerable research by Enteris indicates that Ovarest meets this “Goldilocks sweet spot,” but not all peptides do. Ultimately, not all peptide therapeutics are appropriate for oral administration due to various constraints, from physiochemical to economic. However, for those that meet the necessary criteria, advances in formulation technologies coupled with favorable market dynamics will continue to drive interest across the entire prescription drug spectrum for safe and effective orally administered peptide therapeutics. Joel Tune currently serves as Enteris BioPharma’s Executive Chairman of the Board of Directors and Chief Executive Officer. He joined the company in July 2013, initially serving as the Executive Chairman of the Board of Directors. In January 2016, he assumed the role of CEO. He is a highly seasoned executive with an extensive knowledge of strategy, operations, and business development. Prior to joining Enteris BioPharma, he spent 28 years with Baxter HealthCare Corp. in roles of increasing responsibility within product development, sales and marketing, strategy, mergers and acquisitions, and general management. His last role at Baxter was as Vice President and General Manager of the BioPharma Solutions Business, with global responsibility for the rapidly growing $800M franchise. Since leaving Baxter, he has served as an independent consultant to a variety of private equity, venture capital, and healthcare start-up firms, including serving on the Board of Directors for Unigene Laboratories and Epic Therapeutics. Mr. Tune earned his MBA from Marquette University and his BS in Biomedical Engineering from the University of Louisville.